An iconic coffee with a superb flavour, full body and smooth finish. These pods provide an environmentally friendly alternative to non-recyclable k-cups as their pods are 100% biodegradable. In addition, these pods are certified organic and fair trade. Choose Kienna and... "Make Coffee NOT Waste". Includes one box of 18 coffee pods. These are great. I use them like tea bags. I pour hot water over the "coffee bag" and then let steep for a minute. Great for an easy cup of coffee - and so much better than instant. 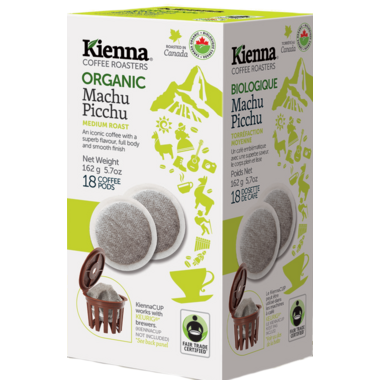 These pods work perfectly in my Melitta One machine, and Kienna is Canadian! I was so pleased to find them here. Coffee is nothing special and with the problems in using the "made for Keurig 2.0 Kienna cup it's just not woth the trouble. The Kienna cup does not work properly and You need to put a label from a proper pod on the cup to get it to function properly. Avoid this junk.